The members of the Hindu outfit did not consider the act as wrong. They equated the act to the burning of Ravana's effigy on Dussehra. New Delhi: Two members of the Akhil Bharat Hindu Mahasabha (ABHM) were detained for allegedly celebrating Mahatma Gandhi’s 71st death anniversary by shooting an effigy of his. Few other members of the Hindu outfit were booked in Aligarh on Wednesday for garlanding Nathuram Godse and celebrating Gandhi’s assassination. 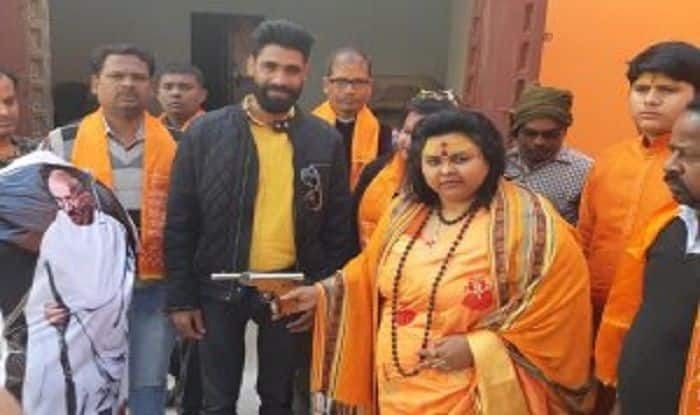 The incident came to light after a video showed ABHM’s national secretary Pooja Shakun Pandey shooting at Gandhi’s effigy three times with an air pistol. The effigy was later burnt at their office in Gandhi Park. Soon a police team rushed to the ABHM office and took two workers into custody. Meanwhile, an FIR was lodged at Gandhi Park police station against the members involved in the act, including Pooja. A report by The Indian Express quoted Circle Officer Neeraj Kumar Jadaun as saying, “Two of the named accused, Manoj Saini and Abhishek, who are seen in the video, were detained. Manoj was seen burning the effigy in the video. The investigation would reveal who circulated the video.” The event was organised without prior permission from the district administration, added Jadaun. The FIR was filed under the relevant sections of the Indian Penal Code, including IPC sections 153-A (promoting enmity between different groups on grounds of religion, race, place of birth, residence, language, etc., and doing acts prejudicial to maintenance of harmony) and 295-A (deliberate and malicious acts, intended to outrage religious feelings of any class by insulting its religion or religious beliefs) and 147 (rioting), police said. The accused who allegedly burnt the effigy has been charged under Special Powers Act. National spokesperson of ABHM Ashok Pandey reportedly said that the recreation of Gandhi’s assassination was done on purpose inside their office premises. He added that the members did not consider the act as wrong and equated the act to the burning of Ravana’s effigy on Dussehra.